The Simple English Wiktionary has a definition for: court. An appellate court is one that can change a decision made by a lower court. This is called court hierarchy. The decision made by a low court can be appealed to a higher one, asking the higher court to change the decision. Higher courts usually have more experienced judges in charge. 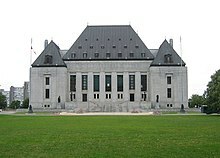 The Supreme Court of the United States is the highest court in that country.